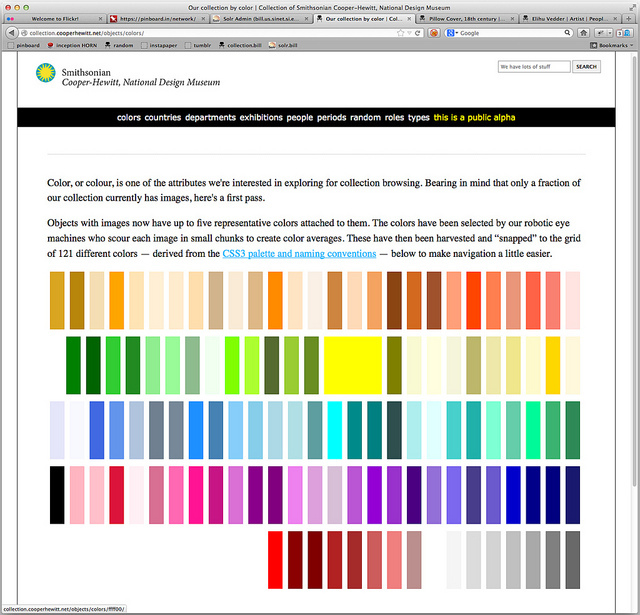 "All your color are belong to Giv"
Today we enabled the ability to browse the collections website by color. Yay! 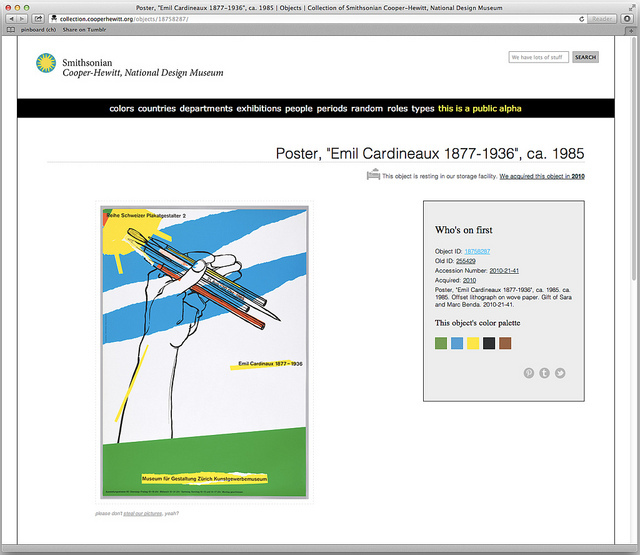 Don’t worry — you can also browse by colour but since the Cooper-Hewitt is part of the Smithsonian I will continue to use US Imperial Fahrenheit spelling for the rest of this blog post. First, we run every image through Giv Parvaneh’s handy color analysis tool RoyGBiv. Giv’s tool calculates both the average color of an image and a palette of up to five predominant colors. This is all based on the work Giv did for version two of the Powerhouse Museum’s Electronic Swatchbook, back in 2009. Then, for each color in the palette list (we aren’t interested in the average) we calculate the nearest color in the CSS3 color spectrum. We “snap” each color to the CSS3 grid, so to speak. We store all the values but only index the CSS3 colors. When someone searches the collection for a given color we do the same trick and snap their query back down to a managable set of 121 colors rather than trying to search for things across the millions of shades and variations of colors that modern life affords us. Our databases aren’t set up for doing complicated color math across the entire collection so this is a nice way to reduce the scope of the problem, especially since this is just a “first draft”. 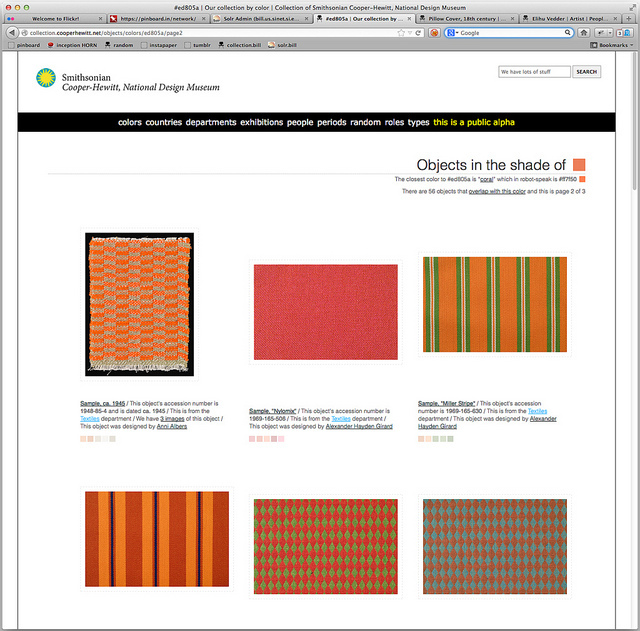 It’s been interesting to see how well the CSS3 palette maps to the array of colors in the collection. There are some dubious matches but overall it has served us very well by sorting things in to accurate-enough buckets that ensure a reasonable spread of objects for each query. We also display the palette for the object’s primary image on the object page (for those things that have been digitized). We’re not being very clever about how we sort the objects or how we let you choose to sort the objects (you can’t) which is mostly a function of knowing that the database layer for all of this will change soon and not getting stuck working on fiddly bits we know that we’re going to replace anyway. color-utils is a mostly a grab bag of tools and tests and different palettes that I wrote for myself as we were building this. The palettes are plain vanilla JSON files and at the moment there are lists for the CSS3 colors, Wikipedia’s list of Crayola crayon colors, the various shades of SOME-COLOR pages on Wikipedia, both as a single list and bucketed by family (red, green, etc.) and the Scandawegian Natural Colour System mostly just because Frankie Roberto told me about it this morning. This allows us to offload all the image processing to third-party libraries and people who are smarter about color wrangling than we are. Both pieces of code are pretty rough around the edges so we’d welcome your thoughts and contributions. Pretty short on my TO DO list is to merge the code to snap-to-grid using a user-defined palette back in to the HTTP palette server. In the meantime, head on over to the collections website and have a poke around. This entry was posted in CH 3.0 and tagged alpha on February 13, 2013 by asc. What an honor! Glad my library has gone to such excellent use! Thank you. Amazing Giv! You’re a superstar! love it, but the main page is buggy… colors on the beginning of the row open up on the next row down and you can’t click on them. hey guys, sorry this comment has nothing to do with the post, but I can’t find another way to ask you…. why do I get a “Security Cat” if I search for “1994-64-1” in the collection database? That’s because that object hasn’t been allowed to be made public (yet). Is the average color for each image available through the API somehow? It looks like RoyGBiv was able to calculate that, but looking around at the API methods and the metadata available, it looks like only color palette information is accessible. Any chance the average color for each will be added to the collections metadata at some point? Interactive timeline design: seeking feedback!